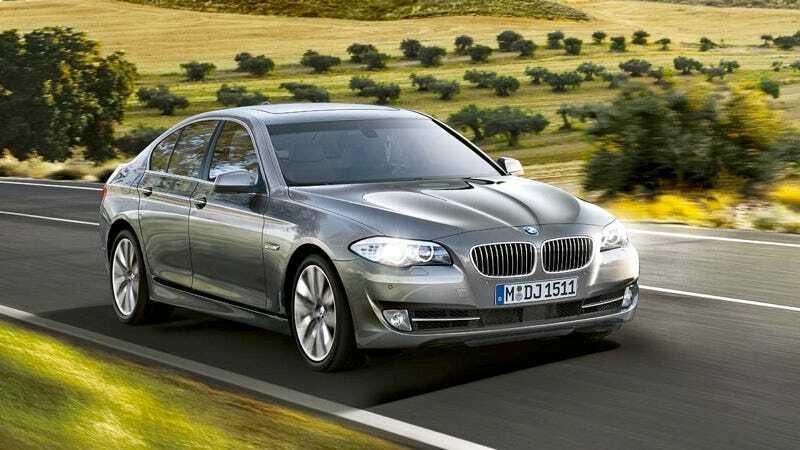 The 2011 BMW 5 Series is finally here. If nothing else, it's a statement against the Bangle-ization of the BMW brand. It's smooth, sleek and an unmistakable return to the BMW 5 Series we've missed. For complete details, we'll direct your attention to the incredibly long-winded press release below (seriously guys, it's killing our servers) but the bottom line is we have to offer our sincere thanks to Mr. Adrian van Hooydonk for not making another ugly BMW. The Perfect Symbiosis of Modern Design and Dynamic Performance. Woodcliff Lake, NJ – November 23, 2009, 2:00pm EST... The world debut of the new BMW 5 Series Sedan marks the epitome of modern design and driving pleasure in the world of premium midsize sedans. Through its athletic and executive looks, driving dynamics typical of BMW, and innovative comfort and safety features, the sixth generation of BMW's executive express accurately reflects the standards upheld by the world's most successful manufacturer of premium cars. With the longest wheelbase in the segment, a long and sleek hood, short overhangs, and a coupe-like roofline, the new BMW 5 Series Sedan stands out clearly from the competition. Overall, the aesthetic looks of the car are achieved through balanced proportions. Design features emblematic of BMW are to be found at the front with its kidney grille inclined slightly forward, in the stylish and elegant side view of the car, and at the muscular rear end. Highly advanced drivetrain and suspension technologies combine agile handling for the driver and a high standard of riding comfort for passengers. When equipped with the Sport Package, the new BMW 5 Series Sedan includes Adaptive Drive, which encompasses Driving Dynamics Control, Electronic Damper Control, and Active Roll Stabilization. Optional Integral Active Steering will virtually extend or shorten the vehicle's wheelbase for improved stability at high speeds and enhanced agility at lower speeds. BMW EfficientDynamics: BMW 5 Series increasing the lead. Joint production of the BMW 5 Series Sedan and the BMW 7 Series at BMW Plant Dingolfing, together with the extensive use of shared components, ensures highly efficient production with the highest standards of quality. Design: Tailored Elegance and Sporting Aesthetics. The proportions of the new BMW 5 Series Sedan are defined in archetypal BMW style by the long wheelbase and hood, short overhangs, aft-set greenhouse, and the coupe-like flowing roofline. The slightly wedge-like shape of the body creates a sporty, forward-moving character. The fresh interpretation of BMW's signature Hofmeister kink at the bottom of the C-pillar further emphasizes the dynamic looks of the car in profile. The entire silhouette is superbly balanced, providing a clear indication of the near-perfect front-to-rear weight distribution for all engine variants. Measuring 2.97 meters or 116.9", the wheelbase of the new BMW 5 Series is the longest in the car's segment, while the sculptural design again distinctive of BMW provides a smooth flow of lines from the front along the side to the rear, creating a body where everything fits together as if out of one mould. The contour lines continue into the contours of the rear light clusters and finally come together above the license plate. Seen from the rear, the new BMW 5 Series Sedan also stands out through the concave surface between the contour line and the wheel arches giving the body a distinctly recognizable waist. The flared wheel arches and the horizontal breakdown of the rear end, in turn, strongly emphasize the powerful stature of the sedan, the wide track and the wheels ending flush with the wheel arches further enhancing this impression. The cockpit is inclined towards the driver at an angle of approximately 7o and the asymmetrically designed center console likewise emphasizes this clear orientation to the driver. The horizontal lines of the instrument panel accentuate the feeling of space. The seating position has been improved over the former model both front and rear, with knee-room on the rear seats of the new BMW 5 Series Sedan up by 13 millimeters or 0.5". Luggage compartment capacity is 520 litres or 18.2 cubic feet, and the folding rear-seat backrest available as an option provides greater flexibility in enlarging the car's transport capacities. In addition to its 40:60 split, the rear-seat backrest also comes with through-loading and, as yet a further option, a ski-bag for additional convenience. Like so many aspects of the new 5 Series sedan, its instrument cluster combines BMW tradition with advanced, beautiful new executions. Here the entire cluster is in a high-resolution Black Panel display, in which four classic circular instruments are most prominent; other driving-relevant displays and readouts – including Navigation if present, vehicle-monitoring functions, upcoming service requirements and other information – also appear here in their various (and function-related) graphic forms. Climate-control settings and controls are located in a second Black Panel display in the center console stack. With the new 5 Series sedan, BMW's 4th generation iDrive control screen appears in two versions: with 7.0-in. dimensions and 800 x 480-pixel resolution in standard form, or with the optional Navigation system, in a dazzling 10.2-in., 1280 x 480-pixel version with a wider range of features and functions as in the new BMW 7 Series. Displays are transreflective so that light from the sun actually enhances the images on the screen. BMW's newest gasoline inline-6 engine will be the powerplant for the new 535i Sedan. It features a single, twin-scroll turbocharger and 3.0 liters of displacement. In addition to High Precision direct injection, the new engine is the first BMW inline-6 to be equipped with both turbocharging and BMW's VALVETRONIC throttle-less intake technology. The combination of these BMW EfficientDynamics technologies delivers improved throttle response from idle to redline, reduced fuel consumption, and substantially reduced emissions. The new engine is rated at 300 hp at 5800 rpm and 300 lb-ft of torque. The torque peak is notable for its incredible accessibility: the full 300 lb-ft is available from 1200 rpm – 5000 rpm. All new BMW 5 Series models will feature an 8-speed automatic transmission, which brings smooth shifting, sportiness and efficiency to new levels of perfection. Compared to the exemplary 6-speed automatic offered in past BMW models, the 8-speed's "taller" cruising gears make a significant contribution to reduced fuel consumption and emissions, as well as quietness. And its wider spread of ratios from lowest to highest gear enhances acceleration and response across the range of driving speeds. Technically speaking, this new automatic's attributes have been achieved via an innovative concept that provides the two additional ratios (7 and 8) with no increase in bulk or weight. In an arrangement not heretofore employed in an 8-speed automatic, four planetary gearsets and five clutch packs are controlled in a way that no more than two of the five clutch packs are freewheeling at any given time. The modest increase in the number of mechanical elements allows the new transmission to achieve unusually high efficiency: the so-called "gearing efficiency" is higher than 98% in all eight gears. In 6th gear, it's highest of all because that is direct drive, with no gearing reduction at all. Combine this with reduced friction and the ability to keep the torque converter "locked up" more of the total driving time, and the transmission becomes very much a part of the new 5 Series' overall efficiency concept. BMW continues as the only manufacturer to offer manual transmissions in the 5 Series' competitive set, underlining the sporty nature of the car, as well as BMW's commitment to driving enthusiasts. The 535i and 550i Sedans will be offered with a 6-speed manual transmission in the United States, providing a level of driver involvement unique in the segment. The new 5 Series sedan continues the roll-out of BMW's Brake Energy Regeneration system on US models. To save energy and reduce the vehicle's fuel consumption over time, this system manages the times at which the alternator charges the battery. Until recently, all BMW front suspension systems since 1965 1 had been of the strut type, in which a long, essentially vertical strut carries the shock absorber and participates in the suspension geometry – that is, along with the lower arms it helps determine the angles wheels take as they move up and down. With the double-pivot lower arms of most current BMW Series, the strut concept has been taken to a high level of sophistication in handling, straight-ahead stability and riding comfort. However, time and progress never stop; BMW conceptualists and engineers continually seek even better solutions. So it was that when the 2nd-generation X5 made its debut in 2007, BMW introduced a type of front suspension that achieves even better results, particularly in a large, powerful vehicle. Now this system has made its debut in the automobile side of BMW's vehicle line, first in the new 7 Series in 2009 and now in the new 5 Series. In place of the strut, this new system has an upper lateral A-arm. The double-pivot lower arms are retained, so that on each side there are three links or arms. While the two lower arms preserve the double-pivot strut system's advantages, the new upper arm facilitates the system's handling and riding comfort by relieving the strut of its geometric duties. • Small positive steering offset, for best steering feel and control under all road conditions. Though the two lower arms don't actually intersect, if you visually extend their axes to a point where they would intersect, you find a "virtual pivot point" that is ideal for achieving this result. Steering offset is the "lever arm" through which road forces act on the suspension system. • Reduced friction because the shock absorber (which remains essentially concentric with the spring, as it was with the strut system) no longer helps locate the wheel, and is thus no longer subject to lateral forces. This allows the shock absorbers to damp the wheels' up-and-down motions in a more efficient, targeted way, enhancing both ride and handling (particularly on uneven road surfaces). • Anti-roll (stabilizer) bar attached to wheel carrier. This arrangement, which differs from many competitors' attachment to a suspension link, applies the wheel's entire vertical movement (up or down) to the anti-roll bar, thus allowing thinner bars to be used. Effective control of body roll (lean) and weight savings are thus achieved. • The trailing (forward) lower arm has a rubber/hydraulic cushion, which provides the most effective "compliance" for reducing road shock. • The transverse (rearward) lower arm is cushioned by a finely tuned rubber element that fosters direct and precise response to the steering wheel when cornering. Precise and efficient: EPS Electric Power Steering making its debut in the BMW 5 Series. The new BMW 5 Series Sedan is the first car in its segment to feature EPS Electric Power Steering. This innovative steering system enhances both the precision and comfort of the steering process, at the same time ensuring the handling typical of BMW with maximum efficiency. Contrary to conventional mechanical/hydraulic systems, steering assistance is provided in this case by an electric motor activated only when assistance is necessary or desired by the driver. The consumption of energy is reduced to zero when driving in a straight line or when taking a corner with a steady steering angle. Integral Active Steering: greater agility in town, enhanced comfort & stability during quick lane changes. The most sporting 5 Series Chassis to date. * Driving Dynamics Control, introduced on the 2009 BMW 7 Series and Z4 Roadster, allows the driver to set the ride/handling/drivetrain behavior of the car through a single rocker switch on the center console. Adjacent to the E-shift lever or manual shift lever is the Driving Dynamics Control selector (logically, on the driver's side). Driving Dynamics Control provides four standard settings that tailor vehicle behavior to different moods. The settings are Comfort, Normal, Sport and Sport+. Affected vehicle parameters include engine throttle response, transmission shift characteristics, power-steering assistance level, and Dynamic Traction Control mode (in the Sport+ setting). * Dynamic Damping Control is an evolution of the Electronic Damping Control (EDC) that has been available on several BMW models. On the new 5 Series, Dynamic Damping Control (DDC) is combined with a slightly lowered (10mm) suspension. Dynamic Damping Control adjusts the shock absorbers to any level of firmness, quickly adapting to road conditions and the driver's demands. Suspension control is always optimum for current road conditions, vehicle speed, and load. The shocks default to the softest appropriate setting for the vehicle's speed, and when the vehicle encounters an irregular road surface, they adjust instantaneously to control ride motions, preserve ride comfort, and maintain adhesion to the road. The system is so fast that even at highway speeds the system can sense a pothole at a front wheel and adjust rear-wheel damping before it reaches the same pothole. Dynamic Damping Control is the first BMW system to vary the shock absorbers' jounce and rebound strokes (wheel moving upward and downward) both steplessly and independently; this capability results in a unique combination of desirable firmness (for handling) and excellent comfort on uneven road surfaces. * Active Roll Stabilization. This high-tech system reduces body roll, popularly known as "lean," in cornering. It improves handling by virtue of better suspension geometry (wheel angles relative to vertical), but there is a psychological component as well: Drivers and passengers alike marvel at the "flat cornering" that results from ARS. When the vehicle enters a corner or curve, or begins an avoidance maneuver, "lateral acceleration" is generated. This is read by a sensor, which transmits a signal to the ECU. The ECU processes this signal and transmits it to the valve/sensor block. In turn, the valve/sensor block determines the hydraulic pressure applied to the anti-roll bars to control body roll. When DSC is fully de-activated, an electronic limited-slip differential comes into play in vigorous driving. By judicious application of the individual rear-wheel brakes, DSC simulates the effect of a traditional mechanical limited-slip differential. This has the effect of better apportioning power between the two rear wheels and thus improving traction in this driving situation. The BMW Parking Assistant: extra comfort ensured through fully automatic steering and optimum user guidance. Innovative Top View and Side View features: enhanced proximity awareness for maneuvering. Innovative combination: Frontal Collision Warning with brake activation function combined with Active Cruise Control and Stop & Go. Lane Departure Warning: camera-based system warns the driver of unintended lane departure even in the dark. Sophisticated headlight technology with intelligent control. Greater safety when driving at night: BMW Night Vision with Pedestrian Detection. Intelligent lightweight construction of even greater fuel economy. All seating positions are equipped with 3-point safety belts; all have force limiters, the front ones also adding automatic tensioners plus pre-tensioning during emergency braking. For protection against head and neck injuries in a rear-end impact, the front seats include active head restraints, which deploy up to 2.36 in. forward and 1.57 in. upward as required – all between the time the rear impact begins and when the occupants' heads would be thrown rearward.